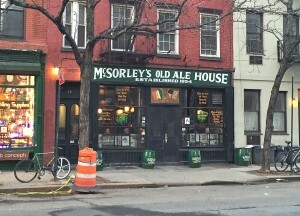 James Atkinson partakes in some of New York City’s finest beer bars and eateries. It’s difficult to spend a week in New York City and pretend you’ve done anything other than scratch its surface. As such, what follows is little more than a roundup of a few of the places I enjoyed on my most recent trip, rather than anything resembling a comprehensive city guide. Consider that New York State ushered in 67 new breweries in 2014, the second most active state behind Washington in terms of brewery openings. Today there are 20 breweries in NYC, compared with six two years ago. 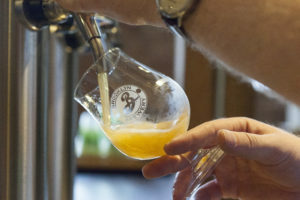 Competition for the city’s tap points is fierce, and has spurred on the emergence of modern craft beer bars that favour constant rotation of beers new and different. 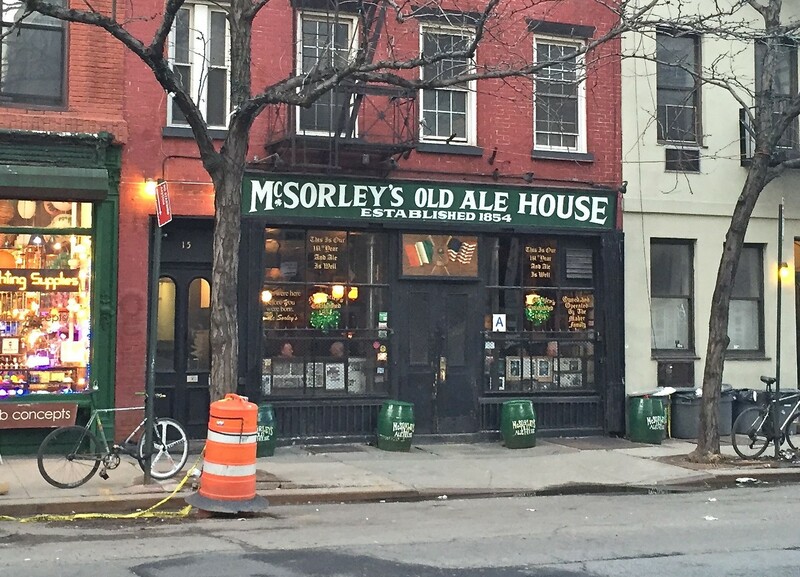 But no-one told McSorley’s Old Ale House, the city’s original Irish tavern, holding court in Manhattan’s East Village since 1854 and unwavering from its ancient interior, sawdust on the floors and simple house beer choices: Light and dark. Order one and you receive two small mugs of the same beer. It’s no mistake, so correct the barkeep at your peril. “Everyone gets a pair. That’s how it’s been done for the last 160 years,” he scolded. 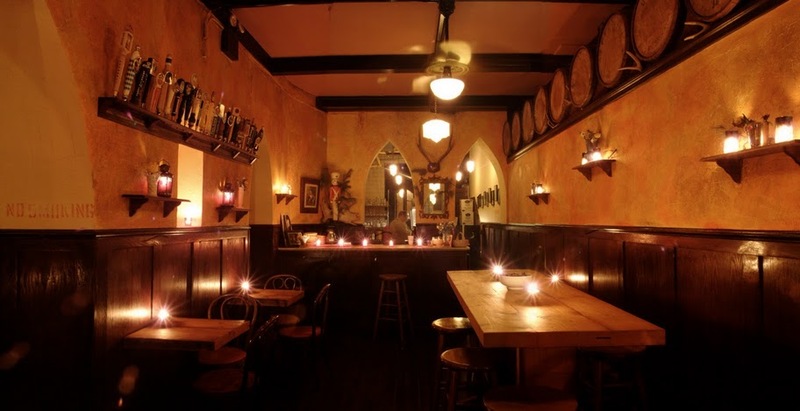 I downed mugs plural of the comforting dark ale and made my way further down East 7th Street, stopping in at Burp Castle, the self-proclaimed ‘Temple of Beer Worship’, with a Belgian-heavy taplist and monastic theming. Famed for ‘shooshing’ patrons if they are having too much fun, Burp Castle promises service that is indifferent at best. Tonight’s surly bartender goes one further, determined to over-deliver on this hard-earned reputation and make me feel truly unwelcome. More inviting was Jimmy’s No. 43, which rounds out East 7th’s triumvirate of beer venues and is in stark contrast to its stubborn, eccentric counterparts. 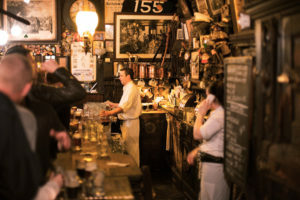 A friendly, intimate basement bar with 17 taps, Jimmy’s emphasises local, sustainably sourced food and booze. Owner Jimmy Carbone is a swine enthusiast: Check out his cookbook, I Like Pig. Around the corner is Upstate Craft Beer and Oyster Bar, which does what it says on the tin, offering a huge selection of local oysters, seafood and beer. 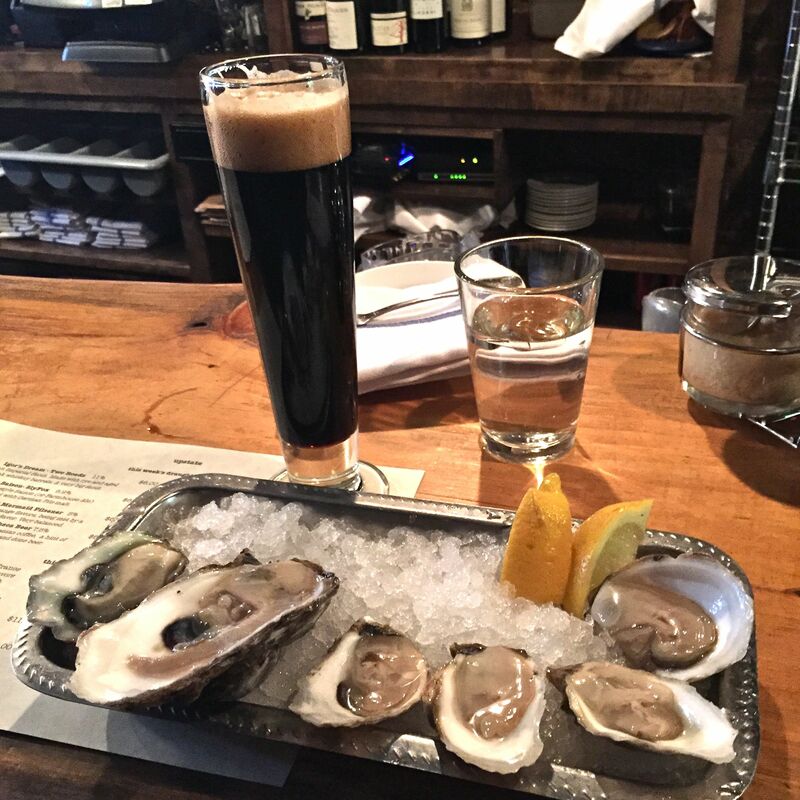 Upstate’s Happy Hour is incredible value: $12 gets you half a dozen different oysters and an accompanying beer, which for me was Igor’s Dream, a barrel-aged Russian Imperial Stout from Connecticut’s Two Roads Brewing. 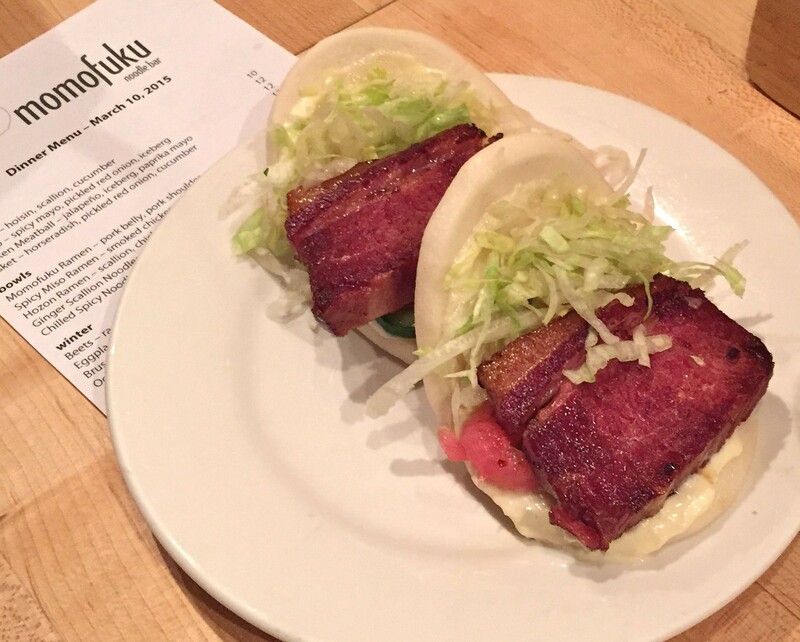 Still in East Village, Momofuku Noodle Bar is no more than a couple of blocks north of Upstate on 1st Avenue, and worthy of the hype. Absolutely every dish explodes with flavour; you can’t go past David Chang’s famous pork buns, while a beef brisket variant is on the menu when we visit. Also among East Village’s myriad dining options is Brodo, a hole-in-the-wall vendor of nutritious, warming broths and soups: Bloody lovely to sip on during winter as you traipse NYC’s icey streets. Start your Brooklyn adventure where it all began – the pioneering Brooklyn Brewery, now one of eight breweries in the borough. After a brewery fresh Lager, graduate up to Brooklyn’s seasonals and you’ll be just about ready for Torst, the new base of Danish expat, Evil Twin Brewing. Torst is only 45 seats and is probably best experienced on a weeknight, rather than a hectic Saturday, as it was when I visited. The bar’s interior is minimalist and its approach uncompromising: You won’t find any wine or spirits here, just offbeat brews from Evil Twin and friends. Brooklyn Brewery, picture courtesy NYC & Company. Break south to Mother’s, which locals tell me offers the borough’s best burgers. I didn’t care, I went just for the beer: 16 taps of America’s finest, mostly with a local bent. Finish your evening with a digestif somewhere like Manhattan Inn, a piano bar and restaurant back up north in Greenpoint. Sip on a ‘Manhattan’s Manhattan’ and ponder the many remaining locations on your NYC checklist that will sadly have to wait until next time.